I used to love making mosaic scrapbook pages and recently was playing around with some ideas to use for cardmaking. I decided I was going to use Art Glitter, Xyron and scrap paper to create some mosaic pieces. It turned out pretty good and I was quite pleased with the results. 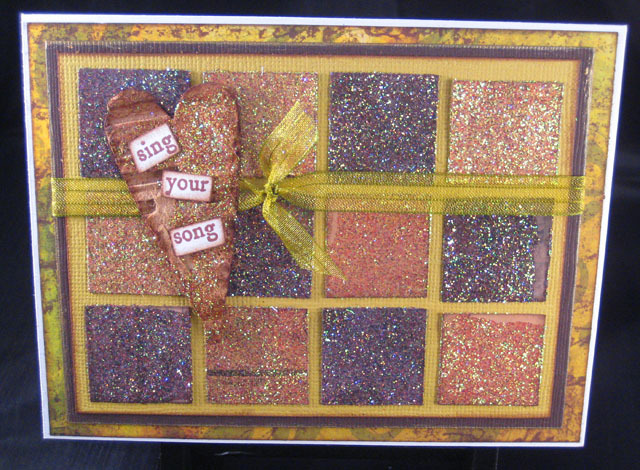 Jump on over and visit the Art Glitter blog to read my post on how I created the mosaics for this card using simple basic tools and scrap paper. So pretty! Thanks for sharing. Love the words on the heart and great colors.